If there is a mental aspect to virtually every type of disease, isn’t it then rational to assume there is a mental aspect to virtually every type of physical pain? The simple truth is that mental states affect physical states and vice-versa. Traditional medicine has labeled this the psychosomatic effect. Interestingly, the specialty of psychosomatic medicine is the latest sub-specialty in psychiatry to become board-certified. Board-certified physicians comprise the “best of the best” in 24 different medical specializations (e.g. neurology, dermatology, psychiatry, etc.) As important, these medical specialties are universally recognized by the medical and scientific communities as vital to public health. Indeed, pain can be caused by emotional and mental states. In science, it has been demonstrated that both mental/emotional and physical pain activates the same areas of the brain: the anterior insula and the anterior cingulate cortex. So – a physiological connection between brain and body exists as well. Here we are going to discuss 10 different types of pain that are directly linked to feelings, emotions and thoughts. Equipped with this knowledge, one can begin to make whatever adjustments necessary to feel better (we’ll also provide some recommendations). Areas of the back and shoulders are arguably where we feel muscle tension the most. Chiropractors, osteopaths and other medical professionals have been explaining the stress/anxiety connection between back pain and mental/emotional health for years. Making matters worse, this type of pain is cyclical. We begin to stress and worry about back pain, which tenses back the muscles; the muscles tense, and then we begin to feel things like frustration and anger. Dr. Christina Peterson, a board-certified physician, writes: “Stress comes in many varieties, including time stress, emotional stress, and the stress of physical fatigue…and (these) emotions pack a wallop for the migraine sufferer.” Furthermore, emotions like anger, anxiety, crying/sadness and depression trigger headache pains. The good doctors recommend practicing relaxation techniques, meditation, and to seek the help of a counselor in the event that this pain doesn’t subside. The buildup of emotions; more specifically, negative emotions, can affect virtually every area of the body. Neck pain, according to Calm Clinic, is one of the most common complaints of people suffering from anxiety-related disorders. It’s nearly impossible to explain every one of the multitude of ways that anxiety can manifest. Financial problems/worries, relationship problems, sadness, fatigue, etc. Many kinesiologists believe that our shoulders are the area of the body most prone to feeling the adverse effects from pressure. Ever wonder where the axiom “Carrying the weight of the world on your shoulders” comes from? Us too. But it turns out there is a whole lot of truth to it. Our poor stomach is where we house most of our worries, fears, and anxieties. Experiencing these emotions repeatedly, without surprise, can cause stomach aches and pains. In fact, as it turns out, chronic stress can develop into stomach ulcers. Dr. Alan Fogel, in a piece published by Psychology Today, writes, “All emotions have a motor component.” The elbow is no different. While medical conditions such as arthritis and others may be the reason for pain or stiffness; mental states such as anxiety and depression can also manifest in strange areas…including the elbows. Similar to the elbows, pain in the hands can arise from legitimate medical conditions. Some even say that hand pain may result from feelings of isolation or confinement. As Dr. Fogel said, every one of our emotions manifests into a physical symptom…so, anything is possible, right? Aside from a documental medical condition, some type of emotional trigger is almost assuredly the cause of hip pain. The human body has more nerve connections in the hip than we would think; so distress can manifest into physical pain in this area as well. The rationale given for knee pain experienced from emotions is pretty much the same as that given for hip pain. Of course, there are many nerve endings in the knee; hence, more of a brain/body connection. As such, it is perhaps more likely that emotional triggers such as anxiety, fear, depression, etc. will manifest into knee pain than other, less sensitive areas, such as the hip. 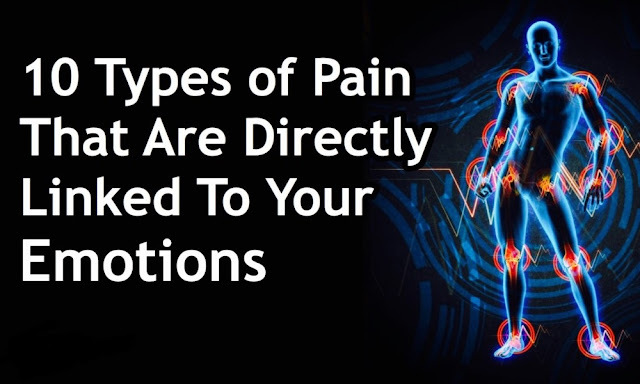 Experts at Columbia University admit that “there’s some evidence that there are psychological conditions that may be associated with physical symptoms,” and that treating the real cause of the pain may be the answer. After investigating the physical pain or stress, it’s worthwhile to do the same with any emotional state(s). What are you feeling? Relaxation techniques (e.g. progressive muscle relaxation), controlled breathing, meditation, guided imagery, and many other techniques and practices exist to help people who are experiencing both physical and/or emotional pain.